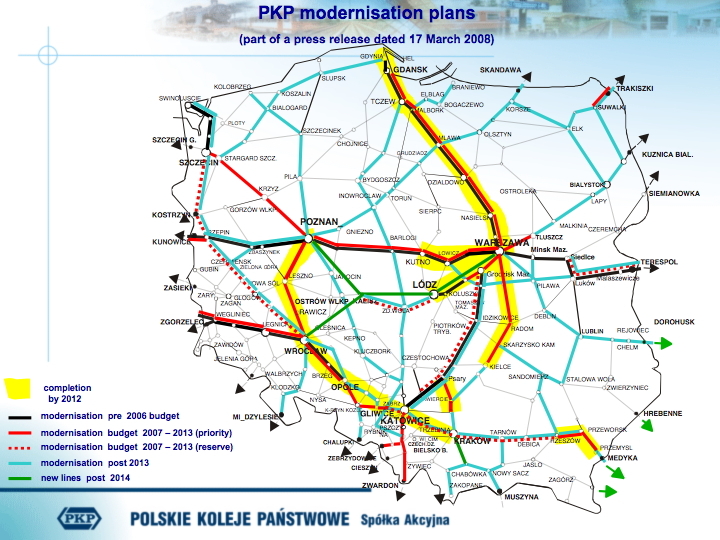 PKP’s track investment plans as at March 2008. Prepared from a PKP press release. It is reported that Polish ministers have agreed to slash a number of strategic railway investment projects from those already agreed for EU funding during the 2007 – 2013 investment round. A PKP PLK (the state railway company’s infrastructure subsidiary) source said that the government had become concerned with the slow rate of progress in processing EU funded projects and hoped that some of the EU funding could be switched to rebuilding Poland’s roads. After 40 years of under investment, EU funded programmes were supposed to be the panacea that would allow Poland’s crumbling railways to be brought up to the same standards as in Western Europe. However, the Polish Government preferred to use EU funds for road building and modernisation and only allocated some 20% of its EU-assisted budget for the period 2007 – 2013 for railway projects. In comparison, Slovakia and Lithuania allocated 35% for rail renewals and the Czech Republic, over 40%. Now – blaming PKP’s poor performance in processing its EU funded projects – two key modernisation projects have been slashed. One is the upgrade of the Szczecin – Poznan – Wroclaw route, the other concerns the line from Warsaw to Bialystok and Lithuania. Both projects were budgeted to cost a total of 10,000 million PLN of which 6,000 million PLN was supposed to come from the EU. Two other projects worth a total 3,500 million PLN on the reserve list are also in jeopardy – Katowice to Zebrzydowice on the Czech border and Zwardon to the Slovak border. Infrastructure Minister, Cezary Garbarczyk, is hopeful that the EU funding is not lost altogether, but can be transferred to road projects. Perhaps someone should tell the Polish government that it should be spending a minimum of 30% of its EU infrastructure funds on railway projects and that by concentrating on road transport the government is in danger of missing its EU targets on reducing CO2 emissions and encouraging sustainable development. Unless the EU Commission itself decides to take Poland to task it looks as if Poland’s railways are destined to be the Cinderella of Europe for many years to come. This entry was posted on Tuesday, 22 June 2010 at 20:10 and is filed under environmental policy, EU funding. You can follow any responses to this entry through the RSS 2.0 feed. You can leave a response, or trackback from your own site. Perhaps this will serve as a wake-up call to PKP and PLK to pull their bloody fingers out if they want to see their share of the EU pie? One thing’s certain – the way the economies of the biggest contributors to Poland’s structural and cohesion funds are going, there won’t be another €67.3 billion in the 2014 – 2020 EU budget perspective. In other words, if PKP and PLK don’t act now, Poland’s railways can look forward to nothing else than slow, certain decline and deterioration. Rather than sort out the root cause of the problem, it would seem that the Polish ministers have taken on the symptom rather than the root cause. Their logic would seem to be ‘The project is not being completed therefore the project is a failure, therefore we should scrap the project’, instead of asking why the project is not progressing, which would appear to be down to poor management, not on an individual level, but on a corporate scale. Until the Polish government takes PKP to task, and has a root and branch change in the management of the company, then the status quo will prevail, and the current culture will be maintained. The government should bite the bullet, hold people accountable, and bring in the right people with the right ‘can do’ culture coupled with the right skills to do the job.